Once the clock strikes 3 o’clock, my entire office heads for the candy cabinet. What causes this sugar craving? I’ve always wanted to get to the bottom of it and be able to say no to my afternoon fix. Most often it’s chocolate. It’s like my body has a chocolate meter and when my levels are too low, an alarm sounds. Other times, it’s chips or popcorn. That salty crunchiness calls to me and no other food will do. I know I’m not hungry so why is my body asking for these empty calories? Food cravings send us mixed signals so we have to carefully listen and evaluate what our body truly needs. They can be physical or psychological. ►Lack of nutrients. Your body is not receiving adequate vitamins and minerals it needs for optimal performance. ►Hormone levels. 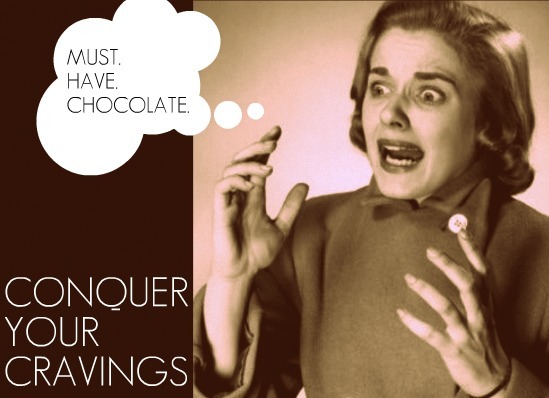 For women, premenstrual cravings are common and the number 1 food we want is chocolate. Chocolate increases serotonin levels, which drop during this stage in the cycle and need a boost. ►Low blood sugar. Skipping meals and becoming famished will cause your blood sugar to dive and lead to intense cravings. ►Restrictive diet. When you restrict, your body feels deprived and fixates on the things you’ve banished. All you think about is the cake you can’t have so you crave it constantly. ►Brain development. The part of your brain that helps you control your behaviors, the dorsolateral prefrontal cortex, may be underdeveloped or damaged. Reduced activity in this portion of your brain can lead to overindulgence of junk food. ►Lack of good but bacteria. Your gut creates satiation hormones but when the good and bad bacteria are out of balance, the hormones are suppressed. According to medical professionals, cravings are rarely linked to a shortage of nutrients so I’ll focus more on the emotional connection. We have a biological reaction when we crave foods. Lack of willpower has nothing to do with it. Cravings are your body’s way of telling you it needs something, whether it’s comfort, love, distraction, etc. Our brains remember how certain foods make us feel and when one makes us feel good, we keep going back. Cravings lie in the pleasure, emotion and memory centers of the brain. ►Ancestors. As humans, we are programmed to seek out fat and sugar as a survival mechanism. Our ancestors were not as fortunate as us to be surrounded by prepackaged foods. They didn’t know the time of their next meal so the body developed eating high caloric foods that would sustain them. The world of industrialized food is working against us now. Temptation lies on every block. ►Endorphins. Indulging in food cravings releases endorphins, which make us feel calm. So when we give in and eat the brownie or potato chips, our body tells us we feel better. ►Over producing hormones. Brain chemicals actually trigger cravings for certain foods. The chemical galanin signals a hankering for sweet, salty and fatty foods. When we eat more of the foods, our body produces more galanin and we want these foods more often. ►Mood changer. Sweet and starchy foods raise levels of neurochemical serotonin, which help stabilize mood. If you eat a steak and all you really want is a hot fudge sundae, you probably feel full but you still want the sundae. The steak did not impact your serotonin level. Only sugar will change your mood and satisfy you. ►Stress. Food is the most common thing we reach for when stressed or feeling anxiety. If I have a crappy day, all I want is ice cream to soothe my sorrows. The goal is to find other means of stress relief. ►Nostalgia. Deep rooted memories of childhood lead to certain cravings. My grandmother would bring me frozen yogurt when I was sick and I want exactly that when I’m under the weather now. Environmental associates cause cravings as well. It’s impossible not to think of s’mores when you’re around a bonfire. ►Emotional eating. This is my biggest struggle. For those of us with eating disorders, we use food to control our emotions. It’s a psychological need that typically requires professional help to learn how to accept and feel our true emotions rather than suppressing them with food. ►See and Smell. We are easily tempted by smells and delicious looking foods. Walk into a bakery and take in the delicious aromas and gorgeous pastry case. How can you say no? ►Wait 20 minutes. Cravings are said to only last 15 to 20 minutes. ►Stay away from restrictive diets. Give yourself freedom to enjoy pizza or french fries once in a while. ►Eat a nutrient dense diet and avoid skipping meals. Plan out your food so you eat a combination of fat, carbs and protein at each meal and eat every 4 or so hours. Staying on a regular eating pattern also helps to avoid abrupt brain chemical changes and keeps your blood sugar steady throughout the day. ►Have a healthy gut. When your gut flora is balanced, you create more satiation hormones. Try eating something fermented everyday to get more good bacteria, like bifidobacteria, in your gut. You don’t need much, just a bite of sauerkraut or 4oz of kombucha. ►Exercise. – Aerobic exercise, the kind that leaves you dripping in sweat, builds new cells in the dorsolateral prefrontal cortex part of your brain which drives your behavior controls. These new cells also improve your memory, focus and concentration, training your mind to focus away from cravings. Once these cells are created they require their own exercise, so make sure to keep your brain in shape. Learning a new instrument is one of the best ways to do this. ►De-stress. Stress tells the brain that we need to be soothed. What better to soothe us than a bag of Cheetos and a chocolate chip cookie? Instead of using food to cope with stress, take your focus away from food and take a walk, do a quick meditation (this helps me SO much!) or watch funny cat video. Even corny jokes help. Why did the hormone go to the gym? To do some serotonin. Haha! ►Keep a cravings journal. Each time you have a craving write down the food, what you’re doing and how you’re feeling. After a week analyze the findings to determine ways to change your behavior. ►Seek professional help. If you have an eating disorder, find a therapist you trust and begin the healing process. Step away from your craving and ask your body what it really needs.